There is a war in your relationship. Not only evil thoughts, also deceitful acts were already committed. Only destructiveness and pain is left. Try to finish as quickly as possible the dispute, even if you have to compromise. Or it will be too late for a future of your partnership. At the beach, a battle took place and the winner collects the swords with a wicked face and the loser is retreating. The sky is cloudy and grey. 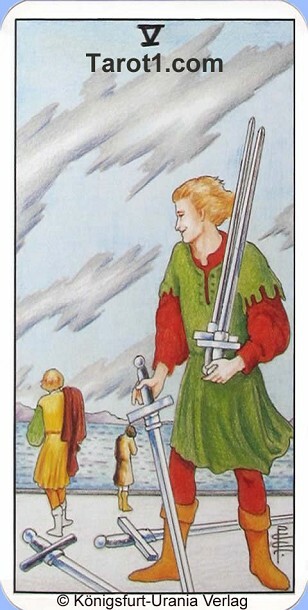 This card symbolizes that the victory was achieved with malice or by unfair means.